Charger Electric Bikes, E-Bike kits, and More!. One hundred years ago no one would have imagined such a bicycle! A bike that turns you into an olympic athlete when you need to be one ? ? ? The Charger is perhaps the most advanced vehicle ever designed for personal use! Both the electronic and mechanical control you have, make this bike the greatest! The Shimano 7 speed internal hub transmission, activated by the Revo twist shifter...gives you unparalleled mechanical assist, to further let you choose how much (or little) you wish to struggle! the ultimate--yet affordable Bionic Bike! After being unavailable for some time, the legendary Charger is anxious to be your set of wheels, and at $800 (base model Standard or Comfort without shocks or extras like the mirror, carrier rack and lock shown in photo...) plus $65 average shipping to Continental lower 48 States, more affordable than ever before! Our popular E4 bike conversion kits now cost $750 incl. shipping, so this is another way of looking at the fantastic value these Charger bikes offer. 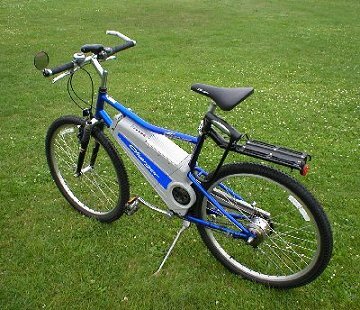 We recently got an e-mail from a customer who recently sold his Charger bike after several years of use. Due to balance problems, he's now interested in a 3 wheeler. He sold is bike for only 250 less than he paid for it! Congratulations Gary in Reno, NV! Now and then customers send us photos...which you might appreciate too! We now have hundreds of bikes in stock, and expect to build more when these start to thin out. New models will likely be just as functional, but to match the stiff competition coming from Asia, we'll most likely have to skimp in a few areas. Maybe substitute the cro-moly frame for less expensive aluminum, or a regular rear gear cluster instead of the expensive internal gear Shimano Nexus 7? For more on the Charger bike ! With Lithium Iron Phosphate batteries (otherwise referred to as LFP or LiFePhO4), the power pack would weigh less than half as much, or the capacity would be larger and still weigh less than the AGM (absorbed glass mat) sealed lead acid we normally use. We're working to make these lithium batteries an option for more demanding customers. Unfortunately, the batteries we've gotten so far have not been consistent in capacity, resulting in more failed packs than we regard as acceptable. Lithium cells must be near identical in capacity, with a very sophisticated BMS (battery management system) to keep cells balanced and to prevent any cell from over charging or discharging too deeply. Lithium battery chemistry is more fragile than lead acid in that it hasn't been able to handle the high current (amperage) lead acid batteries are known to deliver. 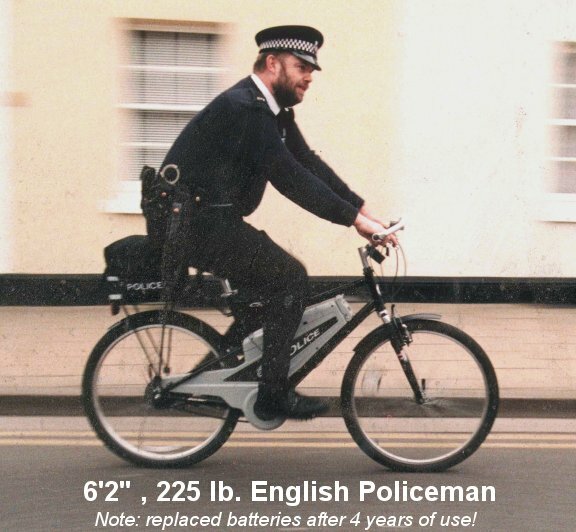 Chinese e-bikes are less powerful than our bikes for the most part, so lithium batteries have worked better for these. But customers must gamble as to whether they'll be able to replace their battery or charger if the vender ceases to support the product. We've been in business for over ten years now and hope to continue supporting our customers with batteries that hold up as represented, and are available from many sources! Unfortunately we haven't found a source of lithium cells and BMS we're comfortable with so far. Several customers have purchased lithium, but the failures have been a heart break (or head ache). It appears we're closer to a sollution now that a new 9C (supposed) capable LFP cell is being manufactured. We're working to have these integrated into the system with a quality BMS so as to justify the $400 likely added to the $800 cost of the bikes. The replacement batteries on their own should cost about $300 since there's a battery charger required, plus the pack adaptation. Even so, if we verify the batteries do indeed last 3 to 4 times more discharge cycles than lead acid, the extra cost will be a wash for those wanting a lighter bike. In any case, we expect existing customers should have no problem upgrading to lithium if they decide to once the lead acid battery is spent. On the issue of battery weight... Consider dropping 10 lbs. off a 20 lb battery. It sounds like a lot if you have to hump the pack a couple of blocks from the parking garage to your office. But if you never have to carry the battery very far it's not significant...certainly not worth the extra cost gamble if the batteries don't hold up as represented by the Chinese manufacturers. Total the weight of the bike, motor system, batteries, AND rider...for 180 lb. rider this amounts to 243 lbs. Losing 10 from 243 is not all that much considering you've got power assist! In any case we'll keep you posted regarding lithium developments and prices!